She is moon: dripping stardust. She is maiden: love on legs, scattering joy. She is song: breathing life through music. She is mother: governess of how to human. She is lover: pregnant promises and burnished faith. 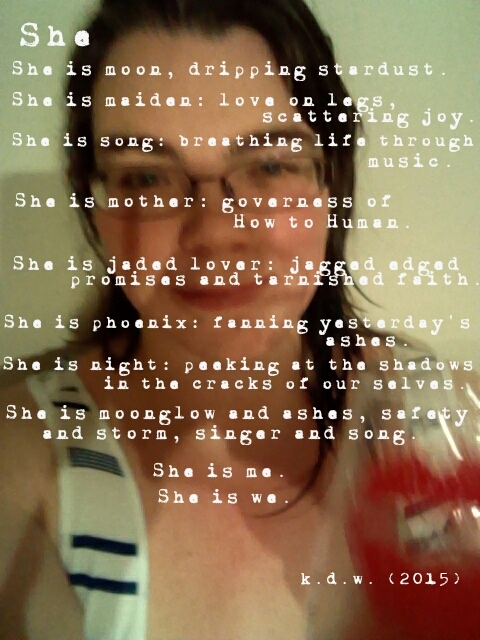 She is phoenix: fanning yesterday’s ashes. She is night: peeking at the shadows in the cracks of ourselves. She is moon-glow and ashes, safety and storm, singer and song.